What do you do when you are getting ready to celebrate National Chocolate Chip Day and your best friend calls you and needs a huge favor? Well of course you drop everything to help her, as she would for you! That’s exactly what happened to me late yesterday when Lulu called stating she needed my help with an all-important letter. So, after a long day at the office, a short trip to the grocery store, making dinner and spending a bit of “quality” time with my family, I quickly ran upstairs to process something noteworthy about my bestie! Mission accomplished – she loved it! Ok, so back onto the chocolate chips — you see, not only does my family love chocolate chips and all the things I creatively bake using them so does Lulu. I have fond memories of baking chocolate chip cookies with her over our long friendship — the laughter and fun we had together in the kitchen still puts a smile on my face! The wonderful smell and the incredible taste of these soft and chewy morsels always remind me of her. Now mind you, my family loves just a simple chocolate chip cookie recipe, to them it’s the best. But, you know me, I love to put a spin on things I bake, so here is my favorite recipe that includes quick oats – I think Lulu would love these too! In a large bowl of an electric mixer, beat butter and sugars until creamy. Add eggs, milk and vanilla extract; beat well. Add combined flour, baking soda and salt; mix well. Stir in oats and chips; mix well. Drop dough by rounded tablespoonfuls onto ungreased baking sheets. 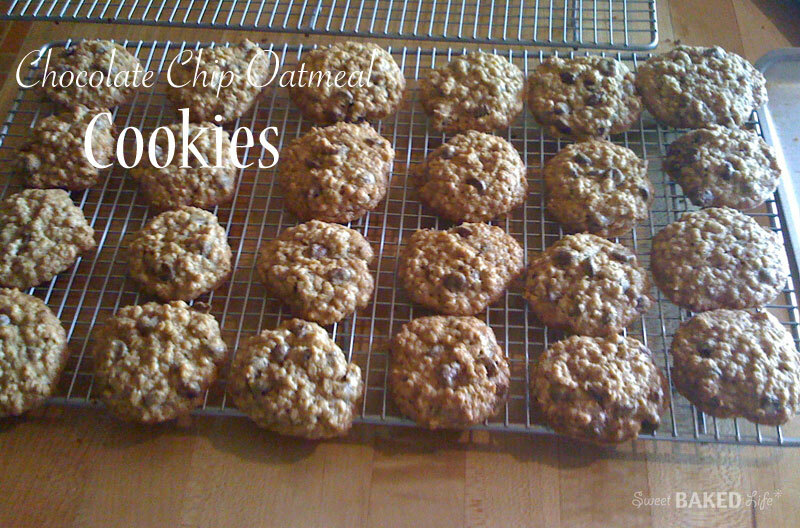 Bake for 9 to 10 minutes for a chewy cookie or 12 to 13 minutes for a crisp cookie. Cool on baking sheets for 1 minute; remove to wire rack to cool completely. Store tightly covered. So, now let’s celebrate National Chocolate Chip Day — hope you enjoy them!